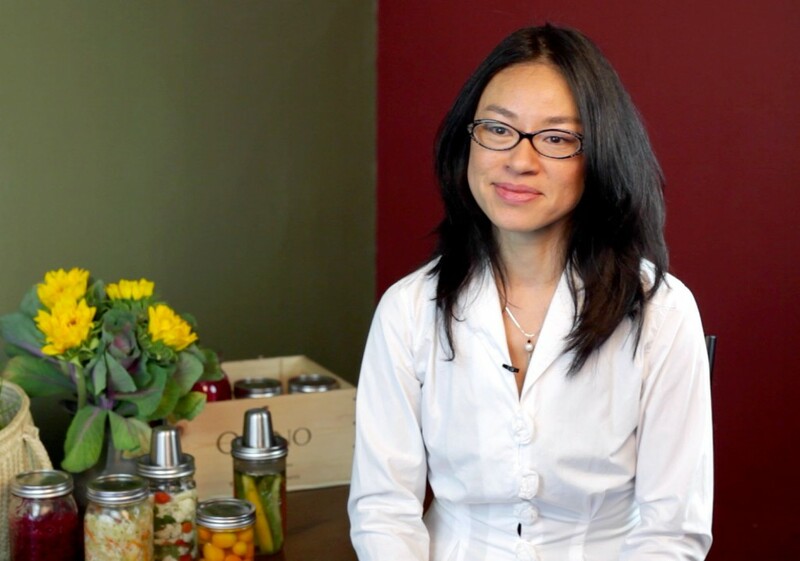 Karen Diggs, a Therapeutic Chef and Nutritionist, took her passion for healthy, delicious food by taking cup-fulls of vegetables and squeezing submerging, brining, sealing, and fermenting it all into a Mason Jar. With help from her partner, Eric Klein, an engineer and inventor, Karen has transformed this thousand-year-old practice of fermenting foods by designing a small-batch device called Kraut Source. See their Kickstarter here: http://kck.st/1pbofHP. Fermentation can be traced back to ancient China during the construction of the Great Wall. Vats of vegetables were cheap and provided a healthy source of sustenance for labor forces. When Genghis Khan conquered China, he adopted the practice of fermentation in order to feed his soldiers. As Khan swept across Asia in his conquest, lacto-fermentation also started to become more popular throughout Eastern Europe. It eventually made its way to Germany, where it became known as Sauerkraut. Fermented foods were perfect for traveling because of its preservation system. Captain Cook brought Sauerkraut on his long journeys and found it beneficial in preventing disease outbreaks (such as scurvy, a fatal disease caused by lack of vitamin C). Also, it was good for digestion and provided the necessary amino acids, vitamins (especially vitamin C), and minerals for his crew. Most people’s familiarity of Sauerkraut is with jars they see on the condiment shelf of a supermarket. Because of the pasteurization process of commercialized Sauerkraut, it is subjected to high heat, which kills off live-cultured probiotics. The natural preservation starts with the simple components of the brine (salt + water) the submerging of vegetables, and an airtight seal on the crocks (large vessels). As fermentation progresses for days, weeks, or even months, the lactic acid from the starches and sugars of the fruit and vegetables develops into healthy bacteria. If done properly, the long awaited results produce a tangy, delicious flavor transforming it into gourmet Superfood. Kraut Source co-founder, Karen Diggs, has experienced the frustration with the process of making Sauerkraut for years. She has used large Crocks, which are quite labor intensive because of the large quantities it produces. Submerging vegetables has its own set of challenges and Karen, like many other Fermenters, had to resort to using items like: rocks, plastic bags of water, and golf balls to weigh down the food in the crock. This cumbersome way of fermenting vegetables had a greater likelihood of creating an inconsistent product, higher chance of mold, took up lots of counter space, and made it less likely to create multiple projects. 1) It keeps vegetables submerged beneath the brine with a spring and press. 2) Its special moat + cap design keeps new air from entering, while allowing carbon dioxide to escape. 3) Its stainless steel and elegantly designed, so it is durable and looks good on the kitchen counter. Because Kraut Source fits onto wide-mouth Mason jars, fermenting with Kraut Source allows for small batches and is ideal for a single person or small family. You have the opportunity to have several small-batch fermented projects going at the same time. Its stainless steel parts (lid, spring, moat, cap, and press) are dishwasher safe, unbreakable, perfect for tight spaces, and attractive. Once the fermentation is complete, you just close it up with the lid and refrigerate it. Some of Karen’s projects have included, carrots, asparagus, cauliflower, salsa, chutneys, Kimchi, pickles, and of course, Sauerkraut. She uses it as a side dish, as an add-on to salads, and toppings for sausages/hamburgers. Kraut Source is portable and easy to take camping or on a vacation. It has taken Karen and Eric about 2 years to create Kraut Source, a small-batch system that is easy to use, inexpensive, and a much healthier alternative than the pasteurized Sauerkraut found in markets. Hard to believe all these live cultures fit tightly in a Mason Jar. This is the simplest and best system I have ever used. The sauerkraut comes out perfectly every time. Couldn’t agree more. Such a nice, durable, and easy design to make many fermented projects.